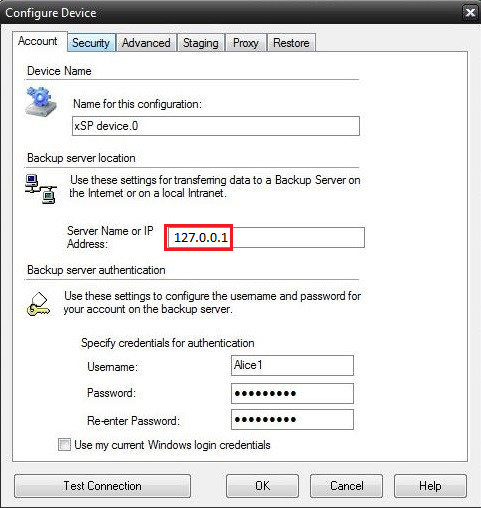 Use this procedure if you wish to restore from Server Storage that has been copied to your computer rather than connecting to the Backup Server online. Determine if you are going to do this on the client’s machine or the storage server before continuing. NOTE: Before starting this method, Prepare/Package the client’s data by utilizing the ‘Restore Wizard…’ button on their account in the configuration manager on the storage server. This will create a copy of the data with a SQL apf file at a location of your choosing. Use existing or Install new xSP client on the machine you want to restore files to. 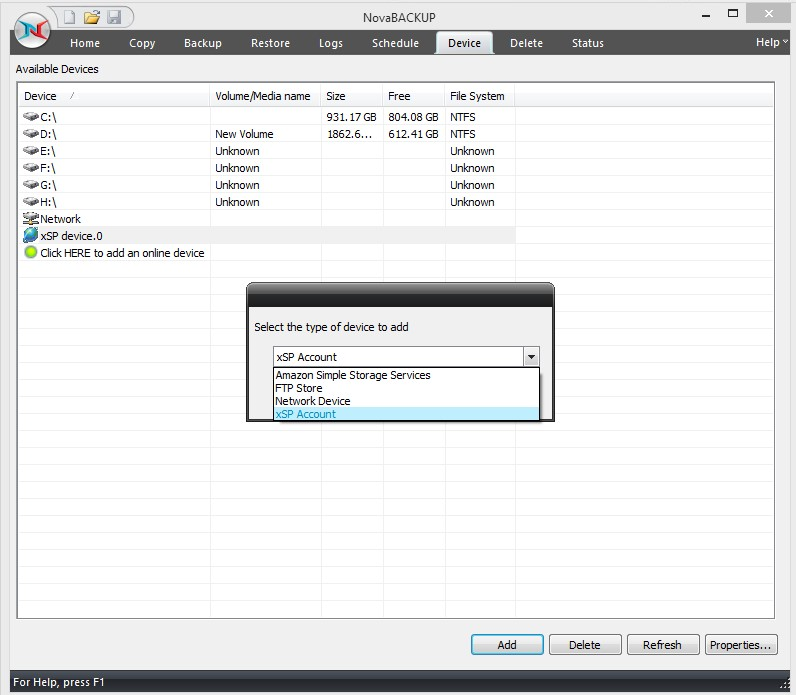 On the xSP client Device tab, click [Add] and select the xSP Account and click [OK]. Enter just the username and password. Go to the Restore tab, don't click [OK] yet. NOTE: Leave the ‘Server Name or IP Address’ field empty as this is a local restore and you do not need to communicate with the storage server. Select the 'Restore from local server storage' checkbox and click the [Browse] button and locate the user data files folder you created with the ‘Restore Wizard…’ that contains the .apf file. Click [OK] to continue adding the device on the client. 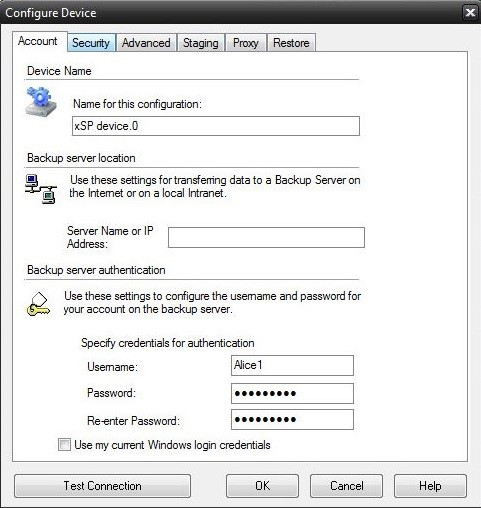 Once the xSP device has been added, go to the Restore tab and restore any files to an alternate location of your choosing by utilizing the Settings button at the bottom of the window. 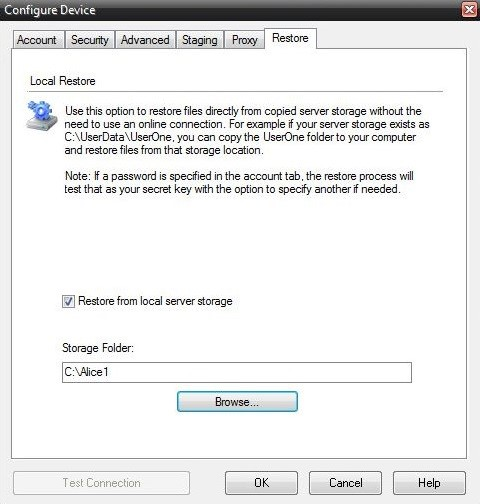 This is a good way to perform a restore for a client where they have limited bandwidth and/or resources to perform a restore from the xSP Storage Server. This method will restore files on the storage server as if it were the client machine. Enter 127.0.0.1 as the Server IP Address. Enter the username and password for the client you wish to restore files from. Click [OK].